Venezuela's Health Crisis: Research From Johns Hopkins And Human Rights Watch : Goats and Soda A report from Johns Hopkins University and Human Rights Watch finds an alarming decline in the quality of health care across the country. 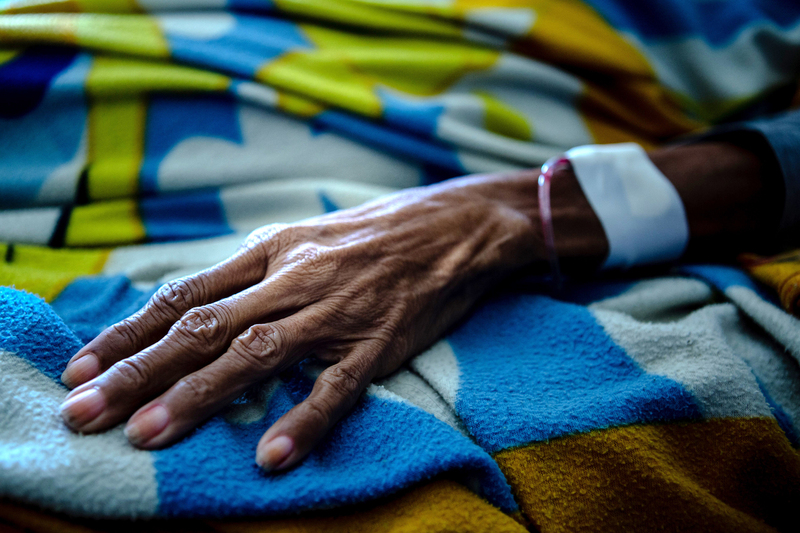 Things in Venezuela are so bad that patients who are hospitalized must bring not only their own food but also medical supplies like syringes and scalpels as well as their own soap and water, a new report says. The health crisis began in 2012, two years after the economic crisis began in 2010. But it took a drastic turn for the worse in 2017, and the situation now is even more dismal than researchers expected. "It is surprising, the magnitude," says Spiegel, who is director of the Johns Hopkins Center for Humanitarian Health and a professor in the Department of International Health at the Bloomberg School. "The situation in Venezuela is dire." "The international community must respond," Spiegel says. "Because millions of people are suffering." Diseases that are preventable with vaccines are making a major comeback throughout the country. Cases of measles and diphtheria, which were rare or nonexistent before the economic crisis, have surged to 9,300 and 2,500 respectively. Since 2009, confirmed cases of malaria increased from 36,000 to 414,000 in 2017. The Ministry of Health report from 2017 showed that maternal mortality had shot up by 65 percent in one year — from 456 women who died in 2015 to 756 women in 2016. At the same time, infant mortality rose by 30 percent — from 8,812 children under age 1 dying in 2015 to 11,466 children the following year. The rate of tuberculosis is the highest it has been in the country in the past four decades, with approximately 13,000 cases in 2017. New HIV infections and AIDS-related deaths have increased sharply, the researchers write, in large part because the vast majority of HIV-positive Venezuelans no longer have access to antiretroviral medications. A recent report from the Pan American Health Organization estimated that new HIV infections increased by 24 percent from 2010 to 2016, the last year the government published data. And nearly 9 out of 10 Venezuelans known to be living with HIV (69,308 of 79,467 people) were not receiving antiretroviral treatments. In addition, the lack of HIV test kits may mean there are Venezuelans who are living with HIV but don't know it. Cáritas Venezuela, a Catholic humanitarian organization, found that the percentage of children under 5 experiencing malnutrition had increased from 10 to 17 percent from 2017 to 2018 — "a level indicative of a crisis, based on WHO standards," the authors of the report write. An estimated 3.4 million people — about a tenth of Venezuela's entire population — have left the country in recent years to survive. Venezuela's neighbors, particularly Colombia and Brazil, have seen a huge uptick in Venezuelans seeking medical care. Health officials in those countries say that thousands of pregnant women who have arrived received no prenatal care in Venezuela. The flow of migrants includes hundreds of children suffering from malnutrition. Despite all the headlines about Venezuela's collapse, researchers were still surprised by the scope of the crisis. Venezuela is a middle-income country with a previously strong infrastructure, Spiegel says. "So just to see this incredible decline in the health infrastructure in such a short period of time is quite astonishing." Despite the severity of the health crisis, the government continues to paint a rosy picture of its health care system — and to retaliate against anyone who reports otherwise, according to the report. Dr. Alberto Paniz Mondolfi, who was not affiliated with the report, spoke with NPR about the situation in his home country. Paniz practices in Barquisimeto, Venezuela, and is a member of the Venezuelan National Academy of Medicine. Paniz says he has seen children in hospitals who appear to be malnourished — and there aren't even catheters available to hook them up to IVs. He has seen people on the streets searching the trash for food to eat. And he adds that a blackout that began on March 7 and lasted for a week has had lingering impact: Some areas still lack electricity or access to running water even now, he says. Paniz says the report from Johns Hopkins and Human Rights Watch paints an accurate picture of the situation on the ground. "It's a very, very timely and complete paper," he says. He praised the thorough research and said he was "relieved" that the health crisis might finally get international attention. So far, aid from the U.S. and other countries has been insufficient to address the crisis, the authors of this report say. But Spiegel sees some signs of hope: Last week, President Nicolás Maduro decided to allow the International Federation of the Red Cross and Red Crescent to enter the country with medical supplies for about 650,000 people. "It's still a drop in the bucket compared to the 7 million or so people who are in desperate need," Spiegel says. But he believes it is a sign that Venezuela's leader may begin acknowledging the crisis and opening the country up to assistance. And the good news, Spiegel says, is that once aid arrives in Venezuela, it can be distributed very quickly. "Venezuela has an infrastructure; it has very well trained people," he says. Paniz agrees that international assistance will be crucial to ending the crisis. "It's a desperate call to not leave us alone," he says. "There is no way in which Venezuela could come out of this by its own."